Doggone Good: Home-cooked dog food - Farewell Fatso! Our beloved Hugo became a part of our family six years ago. At the time, I had a co-worker who owned several working dogs, Retrievers, I believe. I mention this because the idea of making dog food from scratch at home using healthy, fresh food was introduced to me long ago by her. She would prepare large batches of fresh chicken, brown rice, and veggies. Although I wasn’t living an OUTSIDE of the Box lifestyle quite yet the thought of home-cooked dog food intrigued me. I discussed the idea with the vet, but since our guy was just a pup the vet was not in favor of me feeding Hugo a fresh food diet. 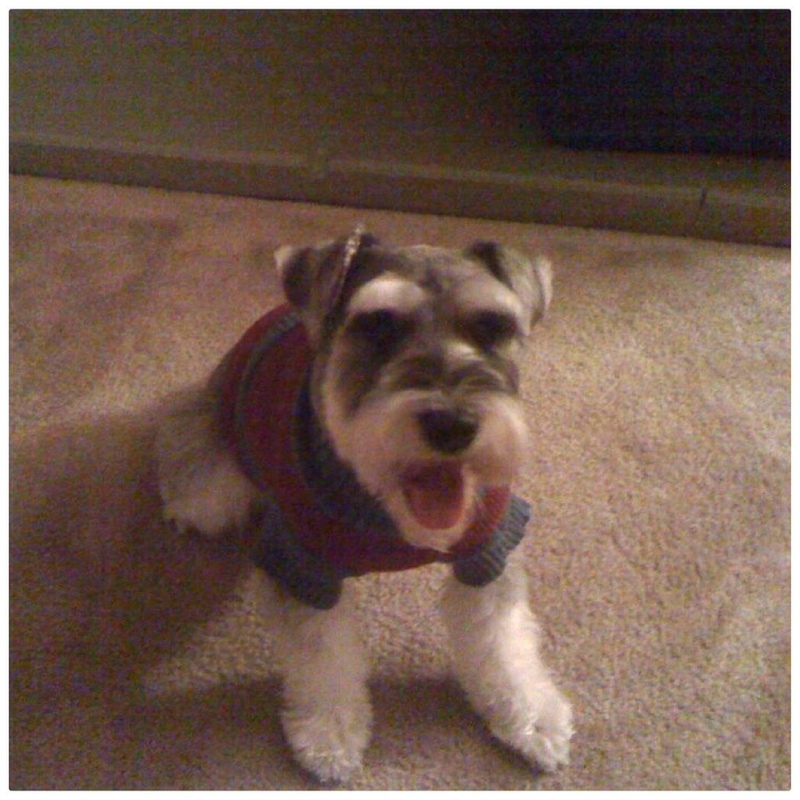 Hugo is a purebred, Salt & Pepper Mini Schnauzer. Over the last couple of years his fur around his paws has started to turn brown. After some research I surmised the brown discoloration is from the dye in the kibble I was feeding him. I used to buy him a decent brand kibble from the pet food store. But, bottom line it was still commercially processed. And, you know how I feel about commercially processed food. Since I’ve completely transformed myself, my diet and I no longer eat boxed, processed food. Preparing fresh home-cooked dog food for Hugo is a natural progression. Last week, I started preparing a fresh food diet for him too. Bye-bye bagged kibble. This is a work in progress. So I’ll be experimenting with what works best. Just as there are many diets for humans there are also tons of theories on what diet is best for dogs. No doubt there is a science behind it all. Some say no to grains, some say yes. I have to find what’s best for him. I’m also considering adding fish oil, kelp, or a pet-food supplement to ensure he’s getting the vitamins and minerals he needs. I’ll check in with the vet to see what he thinks, but this time there is no talking me out of feeding him a fresh food diet. Hugo is officially OUTSIDE of the Bag!